It's very important to us that our students have the best time possible. What our students say about their experience at IIE Hawaii, show us that we have succeeded. Thank you so much. We love you too! II studied at IIE for 6 months. I come from Japan. I studied at IIE for 4 weeks. I come from Germany. There are many great things about IIE. First you have the chance to meet people from all over the world. 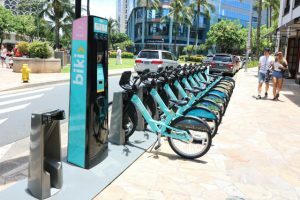 Second IIE is located in Waikiki, so you have everything around you : shops, restaurants and of course the beach. I would recommend IIE and return next year again. I will tell people about the good times and show them beautiful pictures I took. I studied at IIE for 8 weeks. I am from the Czech Republic. I will recommend IIE to my friends. I have a friend who plans to come to Hawaii to study English; I will introduce him to all the teachers because they are all so interesting.My advice, COME TO HAWAII AND GO TO IIE. We are finally in Spain. Our travels were good, instead of being 24 hours on a plane, it was 32 hours total (including the time at the airports). We write a farewell to you because we didnt have enough time during our last few days. We REALLY enjoyed our time in class and in the School activities. All of you were very friendly with us and we will remember every moment spent with you.Thank you STUDENTS for opening our minds about different cultures. Now we know that we are very similar because our hearts are similar. Thanks TEACHERS for your patience,comprehension and help. We can now speak better English. All of you are very good teachers, but even better as people. We are also so grateful to Ed and Ryuko. You did a good job and especially all the help you offered us when we needed it. We hope to come back one day and maybe meet you again. Enjoy your time in Hawaii. We'll never forget you. THANK YOU VERY MUCH. 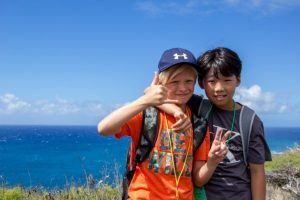 The best thing about IIE Hawaii for me was the many great outdoor school activities and the IIE resources. Being part of IIE allowed me to take advantage of meeting people from all around the world. IIE is located in Waikiki, the heart of Honolulu, a beautiful, clean, and safe place to study and experience American and Hawaiian culture. You can enjoy the beautiful weather, also one of the best things about Hawaii. I'm from Korea, I've been here 4 months. I really liked being here. I studied at IIE for 3 months. I am from Japan. I came here because my friend suggested IIE to me. The best thing about IIE is that the teachers have good skill. I loved going to the beach while I was here, and taking free yoga classes at IIE. I will tell my friends about IIE when I go back to Japan. I hope I can come back! I am from Laos. I have been here for 7 months. I had several reasons for choosing IIE. First, I was interested in studying their courses, and in their activities. I could improve my speaking skill by doing activities. Second, the school is in a good location. It's convenient for me, I don't have to worry about living and transportation. Third, the teachers are qualified. I remember when I first came to IIE. I felt I was welcome to the class. So, the best thing about studying at IIE is feeling at home at IIE. I would recommend IIE to my friends. I would tell them to choose IIE if they desire to take English courses in Honolulu because IIE is one of the top intensive English schools. 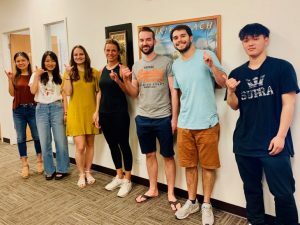 Hawaii is a good place to study because the weather is very nice, there are fascinating views, the beaches are so beautiful, and people are friendly. There are a lot of different kinds of food from other countries. So I like Hawaii a lot. I would like to recommend IIE to be the first choice for everyone who is thinking about studying English in Hawaii. I've been here for 7 weeks. I am from Russia. I came here because my uncle lives here. Hawaii is a nice place for vacation and of course IIE is a very good school. The teachers are very very very nice. I learned a lot of new things. I usually joined the school activities, which were very good. I especially liked the West Side Tour. I would recommend IIE to my friends (of course!). I would tell them it's a good place to learn English with good teachers and good students. Thank you for everything! I'll miss you!